French kids are back in school this week. That time is called "la rentrée" - the re-entry, the return. Somehow that's a real big deal in the French mind. You hear the word many times per day. Every other commercial on the radio presents something for la rentrée, and lots of people are interviewed on TV about what they feel and think about la rentrée, and it is the subject of talkshows and articles. It is not like in the US where there are also "back to school" specials and so forth. Here they seem to organize their thoughts of the whole year around that time. Which seems to last about a month. Doesn't matter if you go to school or not. La rentrée is one of the key concepts in a year. I suppose it illustrates the importance of education. 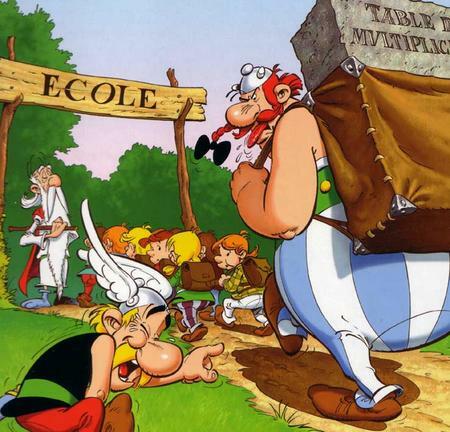 The French are very serious about getting a proper education, and making sure things work right for the kids, and everything is talked through. It also shows how they tend to arrange things in blocks. In August everyone is on vacation. Toulouse was close to deserted and many shops and companies were closed for weeks or for the whole month, and if anything needed doing, the standard message would be that it is vacation time and it might not be possible. And then - la rentrée - everybody goes back to work and school and things open again. The stereotypical image is that on the first of August everybody and their families are stuck in their cars filled with tents and beachballs on the freeways out of Paris. Headed south, not to Toulouse, but further east, to the Mediteranean. And the last day of August, they're all stuck on the freeway headed back. Well, we're not in Paris, so I don't know if it is exactly like that. Almost like regular people we had vacation in August. We were in Denmark for a couple of weeks, which was nice. And now Toulouse is bustling again. Nadia is back in Ecole Maternelle (kindergarten), now in the class for big kids. Zach is back in Lycée (high school). Seems to work out well for them. And Marie, she'll start in a restaurant school, and that's actually not before next month. But it feels like la rentrée alright. OUR FRENCH CLASS J'ADORES YOU! Eh, what? You used my post here in class or what? I did this in French 1, It was okay. I went on google to see if It can help with answers. Jimmy Choo Red Accoutrement Bag” Replica Chanel Handbags Sale got anyone on your account who cast ablaze colors? The appeal in American, Europe, Asia, Australia is higher.